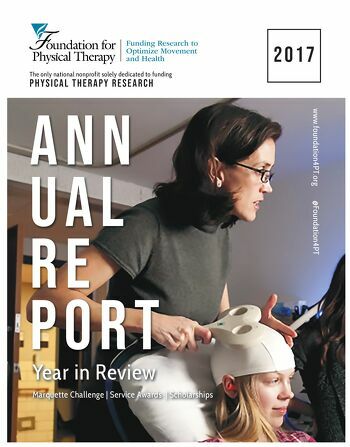 In this most recent annual report, read an update from Edelle Field-Fote, PT, PhD, FAPTA, President of the Foundation for Physical Therapy, outlining the many accomplishments of 2017 including awards of financial support to 28 promising physical therapy researchers and the continued growth of the Center on Health Services Training and Research. 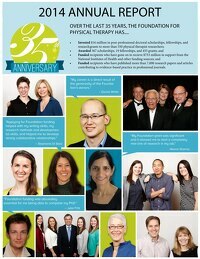 The year also marked the milestone of the largest gift made to the Foundation to date, a $3 million contribution from husband and wife Stanley Paris, PT, PhD, FAPTA, HONLLD(OTAGO), and Catherine Patla, PT, DHSc, MS, OCS, MTC, FAAOMPT. 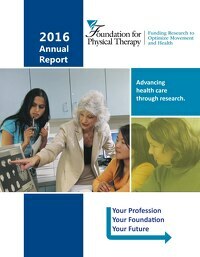 The Foundation for Physical Therapy is committed to using your donations responsibly and effectively to help achieve our mission to fund physical therapy research. 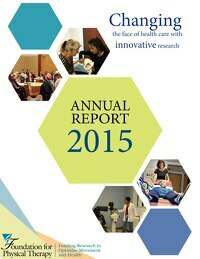 In order to ensure our openness and transparency with our donors, please review our audited financial documents to learn more.